Junko Yokota at the opening of their new dormitories. The Government of Japan, under its Grant Assistance for the Grassroots Human Security Projects Scheme (GGP), has donated 3,322,000 baht for a project entitled “The Project for Construction of a Dormitory for Students at Bankadwittayakom School in Maewang District, Chiang Mai Province”. 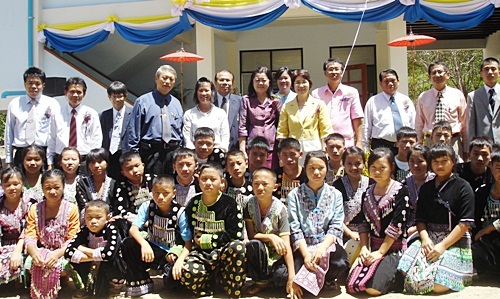 Mrs. Junko Yokota, Consul-General of Japan in Chiang Mai and Dr. Suchida Phongaksorn, Advisor to Office of the Basic Education Commission, Ministry of Education were present at the opening ceremony of the dormitory at Bankadwittayakom School on July 8, 2010. Under the 15-year free education policy, the Thai government is committed to reducing financial burdens on households for basic education starting from the pre-primary education level to the upper-secondary education level. However, in mountainous areas, students still have difficulty in accessing secondary education due to the limited transport to schools remote from their homes, the burden of transportation costs, and the long commuting time. Therefore, such students have to stay at dormitories near schools. It can be said that securing dormitories for students is crucial to expanding their educational opportunities. Bankadwittayakom School, serving more than 645 students, is the only public secondary school which covers both lower- and upper-secondary education in Maewang District. The school accepts students from around the district as well as from the neighboring districts. As a result, 25 percent of the students are children from ethnic minorities, such as Hmong and Karen. However the school had no dormitories for male students and they stayed separately in some houses for teachers. Therefore, the school could not respond to all the needs of applicants due to the poor conditions and the limited capacity of accommodation for students. The Designated Honorary Consul for the Netherlands, Peter A.N. van Loo joined with Peter Smith of AA Insurance brokers. to host several large insurance companies at the Shangri La Hotel on Friday, July 2. Residents of the local Dutch community were invited to attend, and given the fact that the Holland – Brazil game was on later that evening, and with the promise of the Shangri La Hotel’s big screen tv to watch afterwards, the turnout was quite high. 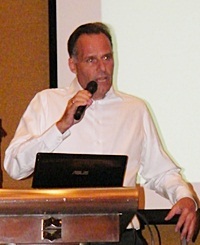 The Designated Honorary Consul for the Netherlands opens the insurance seminar at the Shangri La Hotel on Friday, July 2. Representatives from LMG Pacific Healthcare, IAG, AXA, Interglobal and ThaiHealth were on hand to chat with the guests beforehand. One elderly gentlemen cornered Tom Thomson of LMG about insurance for those over 70, assuming it impossible to receive. Mr. Thomson told him that while difficult, it’s not impossible and that a thorough physical would be required before any policy could be given. At the seminar itself, each representative spoke to the crowd, explaining their companies’ strengths and policies. With most reiterating the importance of having a broker to negotiate with your insurance company, explaining that the personalized attention from a broker was generally more beneficial. The Ministry of Culture is forging ahead with its project of Thai national unity to promote the national identity and encourage Thai people to reconcile and reunite. On June 23, the Office of National Identity Promotion, Office of the Prime Minister’s Office, invited Chiang Mai Governor Amornphan Nimanant and members of the Chiang Mai Provincial Culture Office to learn about the “Thong Trairong Thamrong Thai” project, and the training courses for volunteers to re-establish national unity and identity later this year. Peeraya Mongkolnat, the Cultural specialist in charge of the Chiang Mai Provincial Culture Office said that the Committee on National Identity Promotion is focusing on the current situation of Thai politics and the cause of social conflicts. “Many Thai people seem to lack national unity and harmony, which has resulted in negative effects on the economic and social areas”, she noted. The project was organized with the intent of using the Thai national flag and national anthem as a media tool in launching the promotional campaign to make Thai people feel proud of being Thai again. She said that brochures about Thai nationality and using Thai flag would be printed out together with the training courses and seminars to be held in regional provinces; Chiang Mai in the North, Khon Kaen in the Northeast, Nonthaburi in the Central region, Chonburi in the East and Songkhla in the South. A contest will be held in the provinces with best flag decoration of buildings and houses, with categories for government agencies, private companies and the general public. The training course will invite 300 youths from each province across the country starting at the end of July. The Chiang Mai Health Promotion Meeting was held at the Empress Hotel on July 2 andf 3. Seen here are the many dignitaries and participants in the meeting with Chiang Mai Governor Amornphan Nimanant. Plans are in place to promote Chiang Mai as a health and beauty destination with world class spas and health care leading the way in a promotion titled “Long Stay with Lanna Ways’ promoting both traditional massage, spa therapy, herbal therapy as well as medical care. Chiang Mai Governor, Amornphan Nimanant, who opened the Chiang Mai Health Promotion Meeting 2010 at the Empress Hotel on July 2 and 3, said he felt confident that Chiang Mai was ready to step forward as a world class health and beauty destination. With high quality medical standards the Governor expects that it will attract older people targeting Asian and Middle Eastern countries. Governor Amorphan told the gathered crowd of Ambassadors, Consuls, medical professionals and spa owners that he feels confident Chiang Mai could be developed as a center of health and beauty for the international markets by introducing its integrated and unique cultural identity. Prime Minister Abhisit Vejajiva’s government is pursuing a policy of promoting Thailand as a world class health care provider. “We are focusing on the development of quality, standard health care, as a leading medical and nursing provider, as the number of seniors is increasing steadily over the next 20 years and it will be an important market,” he remarked. Governor Amornphan said Chiang Mai has high potential because of the strength and quality of its medical and dental services which rate highly. “Additionally, the spa and massage business, which today’s meeting theme is called “ Experience Natural Balance with Lanna Culture”, shows off our unique Lanna ways, with taste, touch, smell and sound along with the beautiful unique architecture. “Northern Food, Lanna traditional medicine, herbs, massage and Lanna music, we can say that we are number one in these fields for these services integrated with our culture. These could be further developed for the tourism sector,” he added. 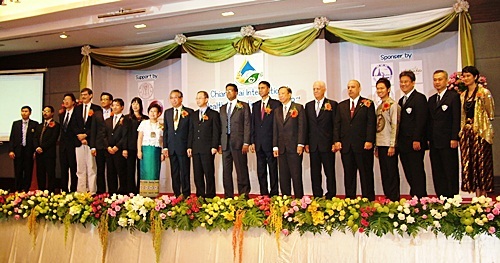 The “Chiang Mai International Health Promotion Meeting 2010” was held by the Chiang Mai Provincial Authority together with the Chiang Mai Provincial Commerce Office and Chiang Mai Health Services Promotion Association. Nathisa Pitchayanont of the Office of Chiang Mai Provincial Commerce said that the meeting had elicited a great response with 373 Thai and 168 foreign business owners, Ambassadors and Consuls had attended the meeting. She said that these kinds of services are becoming more popular, adding that it is urgent that Chiang Mai become more proactive promoting itself globally as a beauty and health services destination. A new fee schedule for consular services will take effect July 13, 2010 at all U.S. Embassies and Consulates worldwide. The new schedule includes higher fees for U.S. passports, Consular Reports of Birth Abroad, and notarial services, as well as lower fees for some services. It also introduces a fee for additional pages in U.S. These changes are meant to ensure that the U.S. Department of State recovers the true costs of consular services through user fees as required by law. The new fee schedule will cover actual operating expenses for the 301 consular posts abroad, 23 domestic passport agencies, and other centers that provide consular services to both U.S. and foreign citizens. For full details of the fee changes and a complete list of the new fees, please visit http://travel.state.gov/news/news_5078.html or the U.S. Consulate General, Chiang Mai website at: http://chiangmai.usconsulate.gov/service/changes-to-consular-fees.html. The Meteorological Department here has warned of heavy rains caused by tropical storms and depressions during the monsoon season starting at the end of July and August this year. Chamnong Kaewchapha, Director of the Meteorological Department‘s the Northern Center warned of heavy rain caused by tropical storms and depressions during the end of July through August. Chamnong Kaewchapha, Director of the Northern Region Meteorological Center, said the extremely hot, dry weather during the past summer was a result of the El Ni๑o phenomenon with temperatures exceeding 40 Celsius in many provinces. However, he said the El Ni๑o phenomenon had finished in May and the weather is back to normal with rainfall in lower volume at the beginning of rainy season during June and July. From the end of July onwards, the low pressure areas from South China are expected to pass by the Northern Thailand, resulting heavy rain from July through September as normal. Tropical storms and depressions are expected in August and September and heavy rains would be found coming from Vietnam and across mainland South East Asia into Northern Thailand. His Majesty the King appointed Asst. Prof. Dr. Chamnien Yosraj as the new President of Maejo University, effective July 8. Dr. Chamnien will be succeeding Dr. Thep Pongpanitch who just completed his second term. Asst. 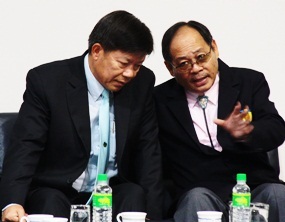 Prof. Dr. Chamnien Yosraj, left, with outgoing President Dr. Thep Pongpanitch. Dr. Chamnien reiterated the goal of developing Maejo University into a leading university in agriculture at the international level. Asst. Prof. Dr. Chamnien, a native of Lamphun, graduated with an M.S. and a Ph.D in Animal Science from the University of the Philippines at Los Banos under a SEARCA scholarship (South East Asian Regional Center for Graduate Study in Research and Agriculture). Dr. Chamnien, 57, was a lecturer in Animal Science and Technology and the past Vice President of Maejo University. The government’s decision to extend the use of the emergency decree in 19 provinces including Chiang Mai and the capital will affect the country’s economy, particularly tourism, only slightly, according to Bank of Thailand (BoT) governor Tarisa Watanagase. Previously, she said, many voiced concerns the emergency might discourage foreign investors to visit Thailand. However, figures released in May showed that foreign arrivals dropped by some 11 per cent particularly in Bangkok and its environs while the number of foreign tourists in other areas decreased very slightly. Even so, she said, the situation must be closely monitored in the long run, but it is expected that tourism will pick up because the European debt crisis has eased. Regarding the government’s decision to extend measures to reduce living costs of low-income earners, Mrs Tarisa said they should not be taken for too long because it could affect investor decisions. The measures should be ended at an appropriate time. Extending the measures will not fuel the state fiscal burden, because some of the measures only require a low budget for implementation, but it will distort the market mechanism. Police reported that an unidentified person smashed up ATM machines in the city on 6 and again on July 8. Police and bank staff are reviewing CCTV footage to see if the vandal can be identified. Two ATM machines in front of the Provincial Electricy Authority of Thailand (PEA) were severely damaged on Thursday, July 8. One ATM machine belonged to Krung Thai Bank while the other was a Government Savings Bank machine. Witnesses reported seeing a man in an orange shirt, wearing a helmet, stop his red Honda Dream motorcycle in front of the machines and smash them with a large piece of marble. This is the second time in two days that ATM;s have been vandalized. Lampang is one of 19 provinces still under the Emergency Decree. Acting on a tip off, the Pha Muang Task Force set up a road block with the Chai Prakarn police in Ban Pha Hong on Highway 107 where they caught twin sisters from Kamphaeng Phet province who were carrying 1,800 yea baa pills with the intent to sell. Patcharaporn in blue and Patcharaphan in white, were charged with possession of yabaa after the passenger bus they were travelling on was stopped and searched at Ban Pha Hong check-point in Chai Prakarn. The military personnel and police intercepted and searched a passenger bus from the Transport 999 Co. where they found the two young women with 1,800 yabaa pills hidden in the suspects’ handbags. The suspects were identified as Miss Patcharaporn Youngtabtae and Miss Patcharaphan Youngtabtae, both 17 of Kamphaeng Phet. They were detained by the Chai Prakarn police for further questioning and legal action. The Foreign Affairs Unit at The Provincial Police Bureau, Region 5 was launched September of 2009 to work closely with the Provincial Police Headquarters nationwide and is working coordinate cases that involve foreigners, according to Pol. Col. Chuchwarin Bunnag, the superintendent. Previously the unit was located at the Royal Thai National Police Bureau. 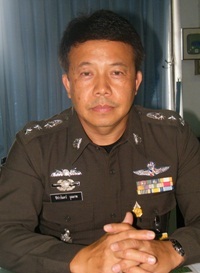 “If there are any cases that concern foreigners then the Foreign Affairs Unit will be the one coordinates so as to help local police deal with cases involving foreigners in a more efficient manner because there are not enough local police offices and staff that can communicate clearly and directly with foreigners,” he said in an interview with Chiang Mai Mail on July 8. Pol. Col. Chuchwarin Bunnag, Superintendent of the Foreign Affairs Unit was first attached in Region 5 and is accompanied by Pol. Lt. Col. Adoon Sijanta, Deputy-Superintendent of the Foreign Affairs Unit and more than 10 staff to help create good relationships between foreign agencies organizations located in the area and local police in the 8 northern provinces, as well as tourist police and immigration police. Pol. Col. Chuchwarin added that there are several Thai and foreign delegations visiting the Unit, while some have contacted the Unit for working in cooperation on helping find Thai and foreign criminals or deal with transnational crimes. “At present, the main job is to work in cooperation with tourism organizations in the North, where criminals usually pretend to be tourists or visitors to the border areas near China, Laos, and Myanmar. There are many drug trafficking cases and illegal immigrants crossing the borders into Thailand,” he remarked. “In the near future, we hope to have close cooperation with other government agencies in the Upper North, as well as from private and tourism organizations and the mass media for the exchange of information,” he concluded. Dams on the Lao tributaries of the Mekong River have no impact on the low water levels currently characterising the Mekong River, said the Lao PDR Minister of Energy and Mines, who affirmed that his country will abide by international agreements if it builds more dams on the Mekong River. Members of an extraordinary committee studying the alarming drop of the Mekong River’s water level, Democrat MP Suthat Ngernmuen, chairing the committee, visited Thailand’s neighbour to the northeast to gather data on dam construction and water management in the branches of the Mekong River in Laos. 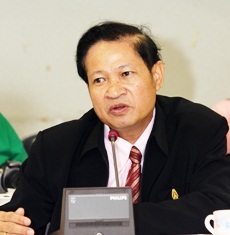 Minister of Energy and Mines Soulivong Daravong reported to the Thai parliamentary committee that Laos considered the impact on the Mekong River in its operation of the dams. The Nam Ngum and Nam Theun dams haven’t affected the water level in the Mekong River as the waters reserved in the dams will be finally released into the Mekong River. In the past dry season, water from the Nam Theun dam helped increase the water level in the lower Mekong River, so it is not too dry, the Lao minister said. “We have studied so many planned dam construction projects but there has been no decision to build any so far. Two dam projects in Saiyaburi and southern Laos near Cambodian border have been studied,” he said. He confirmed that Laos will comply with international agreement and regulations transparently, particularly regarding the Saiyaburi dam which is believed to be of potential benefit to both Thailand and Laos. According to the initial investigation, there are no problems related to flooding but the dams will affect fish stocks. A solution will be worked out on that, he added.